Located just a few minutes north of Casper, Bar Nunn has a lot to offer! Many of the homes in this area can qualify for special financing options and are generally priced very well! For more information, call House Real Estate Group at 307-462-1985. The Town of Bar Nunn was originally the site of Wardwell Field, Natrona County’s airport until 1952. 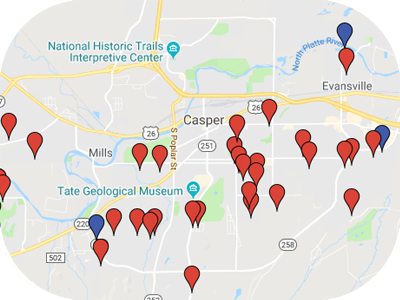 That year, the United States Army Air Corps Base purchased property along U.S. Highway 20-26, and relocated the Casper Natrona County International Airport. Romie Nunn, a local rancher and successful businessman, who moved to Casper in 1918 with his family, owned a portion of the Wardwell Field property. He repurchased the airport property (consisting of 640 acres) in 1954 for $20,500. Mr. Nunn hoped to make it “the horse center of the Rockies” but ultimately subdivided the area in 1958, calling it Bar Nunn Ranch Subdivision. Later, Mr. Nunn registered the Bar Nunn brand (-N) with the Wyoming State Livestock Board. In the late 70's the homeowners association of Bar Nunn Ranch Subdivision experienced deficiencies in services related to snow removal and street repairs and voted to incorporate as a municipality. The Subdivision became a Town in 1982. The formation of the Town improved service availability and funding avenues. Although no longer an airport, the former runways now function as Town streets.